Boats and I really aren’t friends. It isn’t anything personal, on my part anyway, it’s just that they make me sick. I love to be in the water, but floating atop glistening waves just turns my stomach into a cramping and heaving mass that seems to want to do all it can to crawl out of my body. I’m sorry if you’re eating while reading this, I probably should have included a disclaimer. 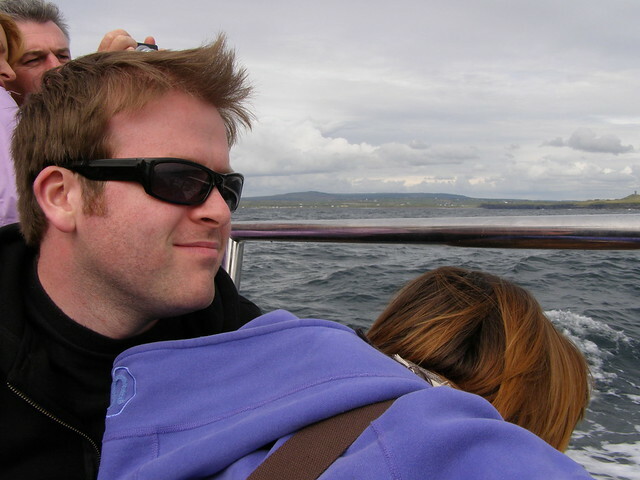 It was with trepidation that I boarded the fishing boat that was to be the vessel to carry us to Inis Oirr and along the famed Cliffs of Moher in County Clare. 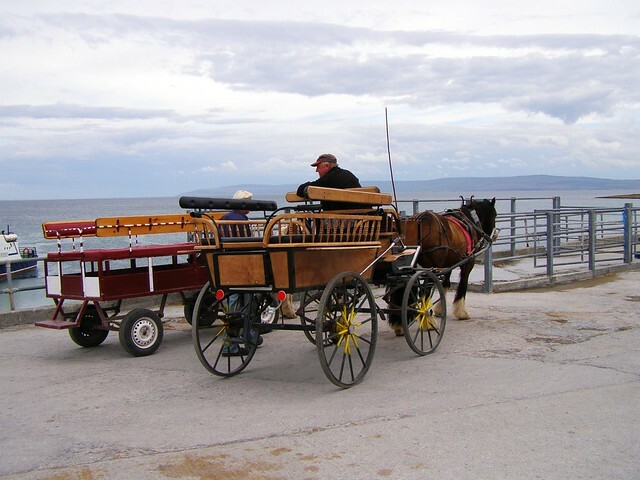 We had spent the night in Doolin, a beautifully old-fashioned sea-side town, and this sunny morning seemed like perfect conditions for exploring the smallest of the Aran Islands and sailing past the majestic cliffs that rise 214 metres out of the crashing Atlantic Ocean on Ireland’s west coast. 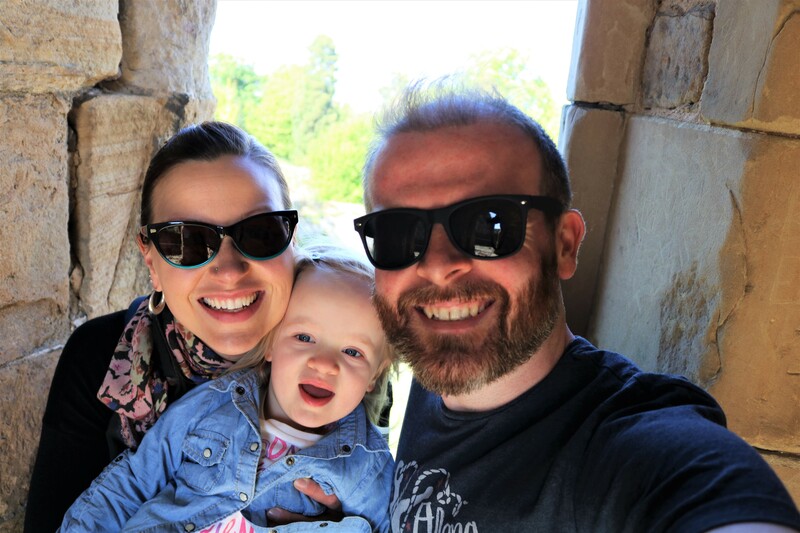 The half hour trip over was smooth and with bright sun and clear skies overhead you could be forgiven for thinking that we were in the tropics, not on a little rock that has the tenacity to poke its head out of the tumultuous seas eight kilometres from the mainland. This isn’t a big island, it measures more or less 2 miles side to side and top to bottom, but it is still home to about 300 people. It must be a strange existence to live on a remote island that is regularly blocked off from the world due to bad weather. I can imagine it would get lonely, but places like this also always exude a sense of community that is sorely lacking in less remote parts of the world. This seems like a place where for centuries your very survival was dependent on those around you and this spirit seems to remain today. 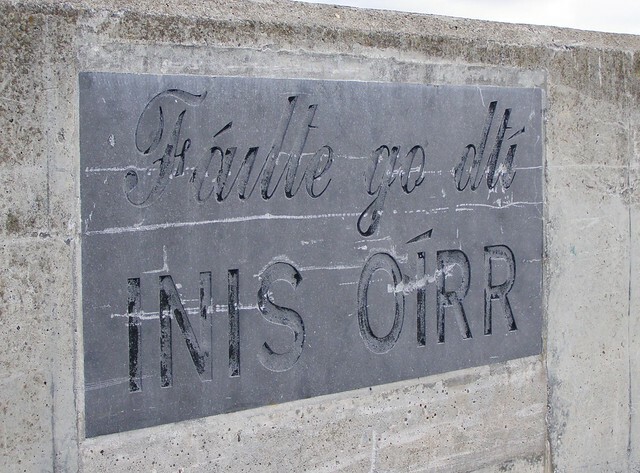 Many people choose to explore the island from one of the pony and traps that greet visitors as soon as they arrive at the wharf, but we decided to take to Inis Oirr on foot. Armed with nothing but a map and some water we set off to discover the delights of this little island. 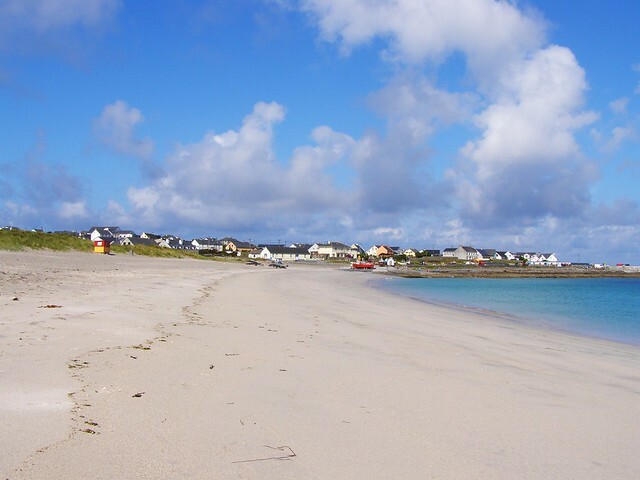 The four hours we spent on the island were more than enough to make a reasonable circuit of the island, as well as enjoy a lovely lunch at the Fisherman’s Cottage Café. So, what does this have to do with fields you may ask? 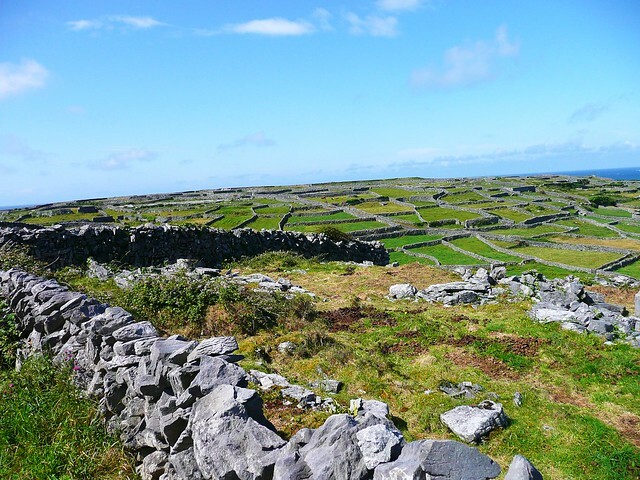 Well, my enduring memory of Inis Oirr has to be the seemingly infinite fields all delineated by ancient dry stone walls. The walls snake their way around the island and it seems as if every last inch of land is compartmentalised into one of these tiny fields. 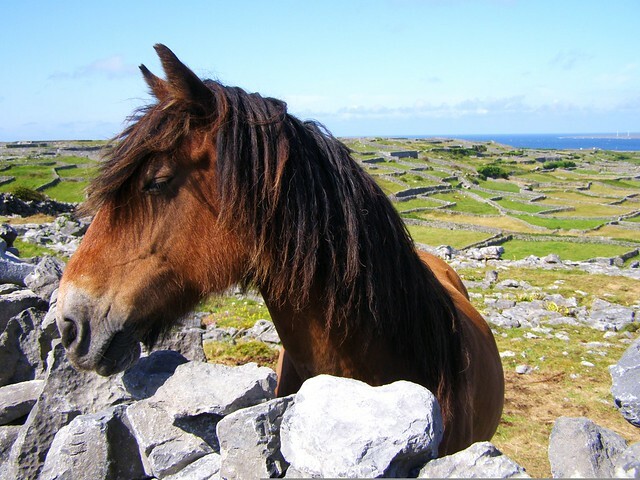 The island is a patchwork quilt of stone and grass, punctuated by the odd horse or donkey. 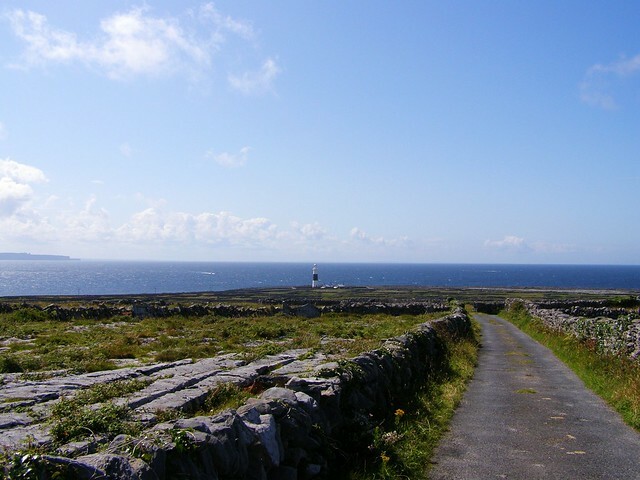 Word has it that all together the Aran Islands have roughly 1,500 kilometers of drystone walls over an area of just over 11000 acres (just under 18 square miles). In other words, there is approximately 1.15 kilometres of wall for each of the islands’ 1300 permanent inhabitants! My other enduring memory is having to pee behind one of these beautiful stone walls, but that’s a story for another day. 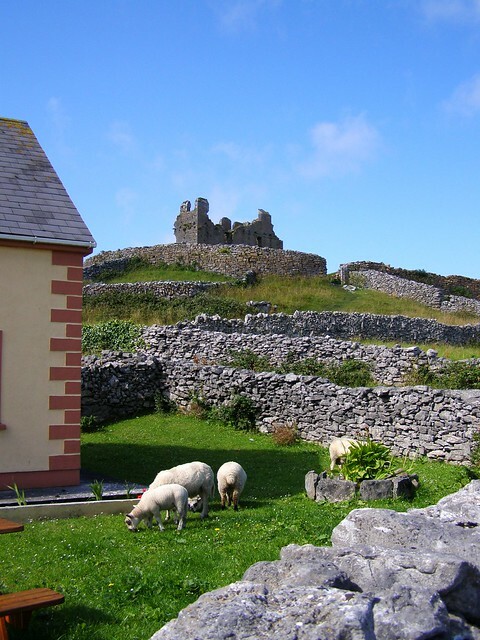 Apparently the stone walls serve to more or less hold the scant amount of earth that tops the limestone island in place, thereby making the largely infertile land slightly more arable. Apparently this process is called land making – look, we all learned something today! At the end of a lovely day spent exploring Inis Oirr we boarded the boat that would take us past the Cliffs of Moher before disembarking back in Doolin. 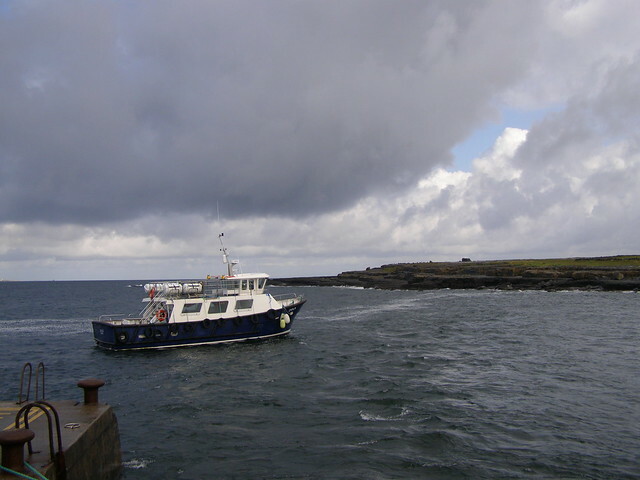 Unfortunately, the trip went slightly awry when a fishing net was caught in the boat’s engine and we were marooned about a kilometre from Doolin in steadily increasing swells. If you are looking to instil fear into the hearts of your passengers I would suggest following the lead of the intrepid sailors with whom we had entrusted our safety – run around the boat in an increasingly agitated manner while giving no explanation to the passengers who are becoming progressively more concerned as the minutes go by. Enter my famously weak stomach. Damian insists that we were stranded for about an hour and a half but it felt like much longer to me. Much, much longer! I managed to wedge myself onto a bench at the side of the boat, facing out to see and trying with all my might to keep my lunch down. I was lucky to have an outside seat, others weren’t so lucky and I don’t think I need to tell you their fate. Suffice it to say, their shoes needed a good cleaning once back on dry land. At one point I came very close to throwing myself into the freezing Atlantic Ocean because I was convinced I could swim to shore and then my heaving stomach would be saved. This may sound dramatic but anyone who suffers from a stomach like mine will completely understand. Eventually the crew managed to get the engine working for long enough to get us to shore, but not before I burst into tears when one of the crew members asked me to move in order to drag us into the wharf. All of the blasted passengers with sea legs laughed at me including Damian and my mother. This isn’t one of my proudest moments. I have never been so happy to step back on dry land. While everyone disembarked that blasted boat one of the crew members approached Damian and confided that the boat really was in quite a bit of danger and that they really shouldn’t have gone out with the seas as they were predicted. This did little to calm my nerves. The nice man they offered the three of us a free Cliffs of Moher cruise for the next day. We declined. 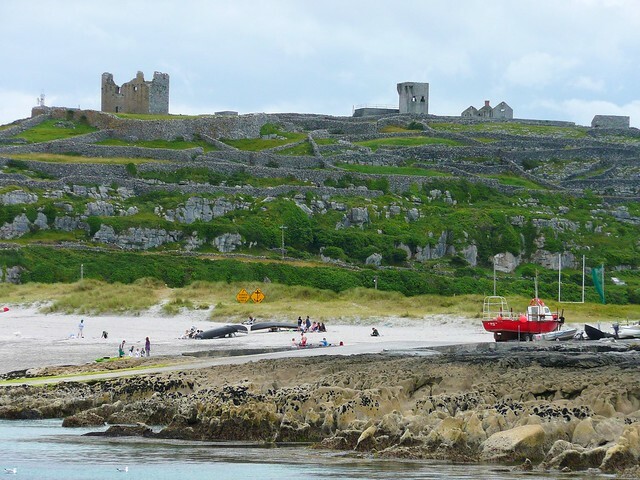 But, you know, Inis Oirr was nice so you should take a trip! Thanks! In retrospect it was an entertaining day, but not so much at the time! Never heard of this island, but it looks special and pretty, seen through your eyes, words and pics! And how awfull you must have felt on that boat. Seasickness is horrible. I would probably burst into tears as well! What a beautiful place, and what a shame that you had to suffer a boat trip to reach it! The good thing about seasickness is that is disappears the moment you step back onto the quayside.